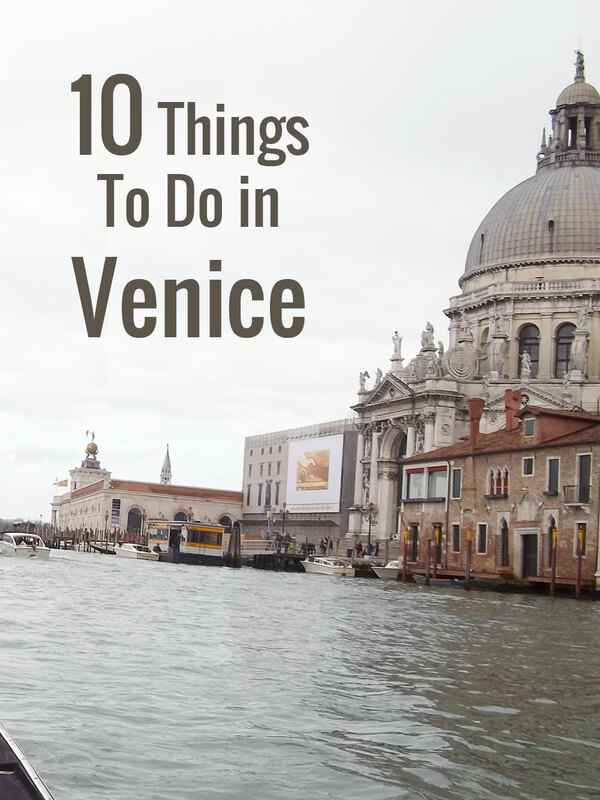 10 Things To Do in Venice July 28, 2015 · 17 min. readThis article may contain affiliate links. Unlike most cites, Venice is a "motor free city". This means no cars, no motorbikes and no Segway's (people still use those things... right?). You will get around by one of two ways: foot or boat, and since Venice is laced with scores of twisting watery canals, you'll need a boat that can navigate the city, and that's where the gondola comes in. 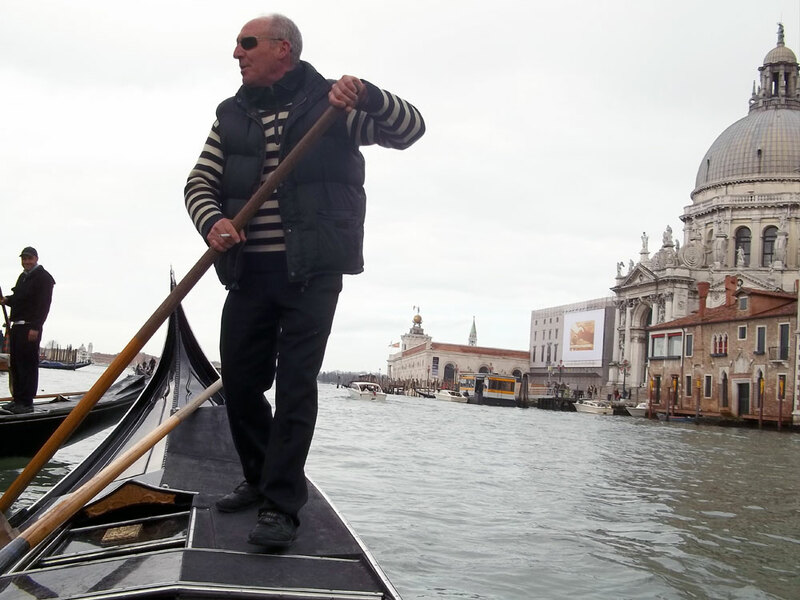 Venetian gondolas go hand-in-hand with those who control it, the "gondolier". Most gondoliers know several languages, as people from around the world flock to Venice, but some only know key words, such as "cigarettes" or "restaurant". However, all of them are full of knowledge about the city and are more than willing to help you find wherever you want to go – for a price, of course. Taking a gondola through Venice’s canals also showcases the sad signs of a decaying city. Venice is built on petrified trees, and as the centuries roll past those trees have begun to sink or break. With the ocean's tides getting higher, Venice floods on an annual basis. A massive European project is underway to save the city by controlling the water from entering the bay, but many believe Venice is doomed. Glass blowing is one of those things that seem incredibly boring until you actually see it. Unlike watching most artists create something beautiful over the course of days, weeks or months, glass blowers do it within minutes, and their dedication to detail is ethereal! 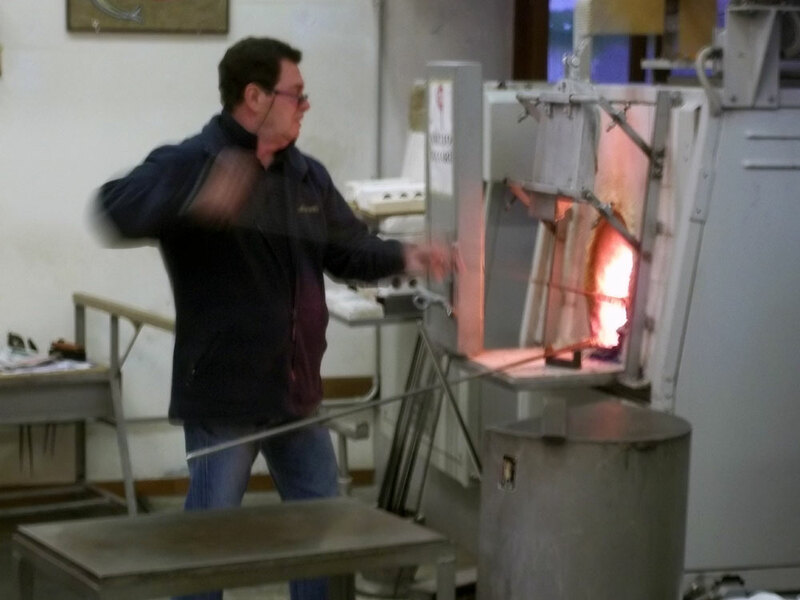 Starting with a solid tube of glass, the artisan will warm the end inside a furnace until it becomes a molten glass candy apple. Through cooling by blowing on it, molding it against their glove or an anvil, and melting it again in the furnace, the glass blower can turn this ball into anything imaginable, such as a bowl, a cup, a Christmas ornament, an earring, a horse, a tiger or a dragon. During the demonstration the glass will transition from a bright red to a dirty orange, down into a light brown and then into black, which is when the artist will dip it into a bucket of water, solidifying its fate. And afterwards it is for sale. Shopping on a bridge!? Italy loves its shopping, and Italy loves its bridges, so it would only make sense that one of Venice's most iconic locations would be covered in shops! Glass blown trinkets, leather purses, watches, jewelry, clothing, food and freshly caught fish sprinkle both sides of Rialto Bridge, extending down its beautifully angled arms and into the heart of the city. Some say if you haven't seen this "eighth wonder of the world" then you haven't seen Venice, and I agree. The bridge is not only a joy to march over, but also to cruise beneath on a "standing gondola" or a "traghetto". Both ways of observing the bridge not only shows the magnitude of it, but shows the beauty of what Venice encompasses. Be warned when shopping in Venice, however, as although items in shops may appear genuine due to their exorbitant prices, often times they aren't. While it may be tempting to buy an expensive trinket on Rialto Bridge, it's best to get them from an authentic store instead. Also, keep an eye on your wallet as Venice is famous for their pickpockets. 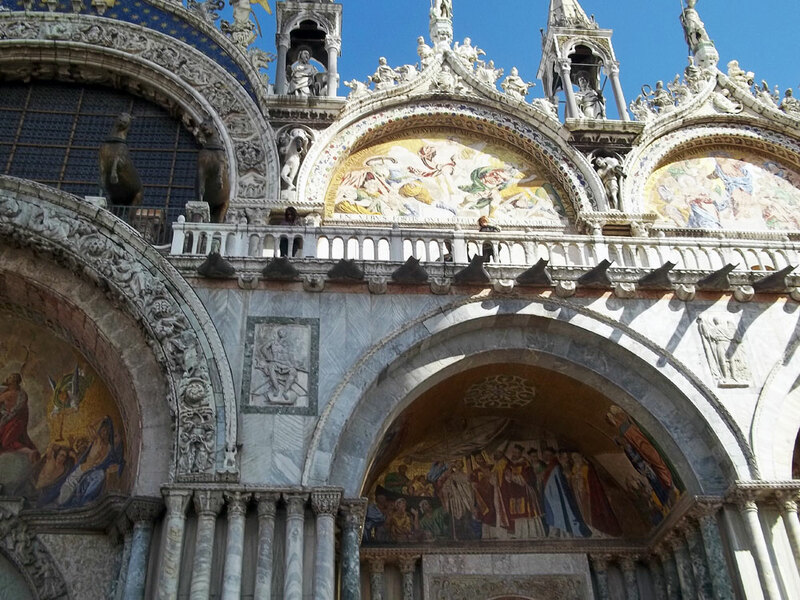 There is a reason why Piazza San Marco has been used as Venice's main square for over 900 years: it's gorgeous! With the expansive Grand Canal to the south, the extravagant San Marco Basilica to the east, the towering Torre dell'Orologio to the north, a gold painted square to the west and the triumphant San Marco's Campanile stabbed into the heart of it, Piazza San Marco is an eyeful of wonders and beauty, and it doesn't take long to realize why it is the heart of Venice. The piazza is full of people and the constant cry of seagulls. Nothing is better than sitting in the piazza and eating gelato, watching the people rush by and smelling the salt water scent wash over you from the Grand Canal. 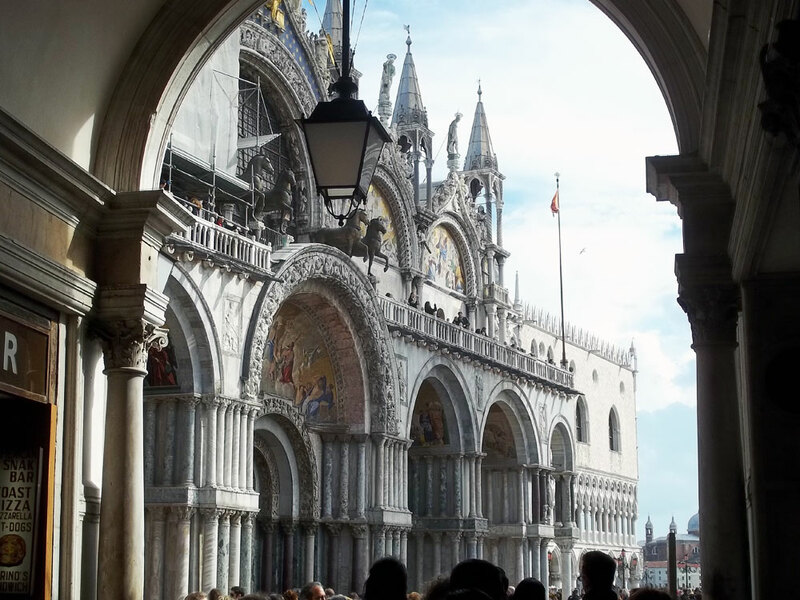 If you're lucky, you might even hear the bells in San Marco's Campanile ring. But why wait for the bells to come to you, when you can climb up and go see them yourself? 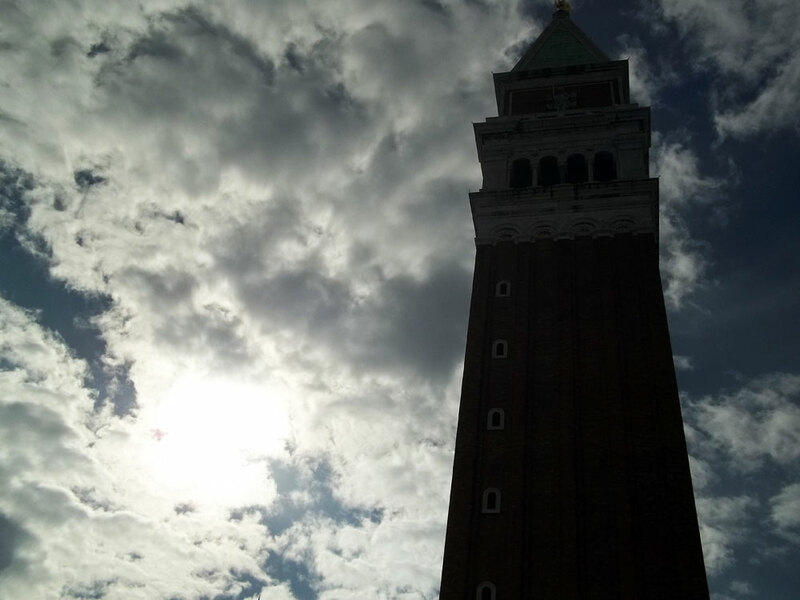 As a beautiful brick tower that reaches nearly 100 meters into the air, one would forgive you if you thought San Marco's Campanile was as old as Venice itself. In fact, the building in its current form is just over a hundred years old. After surviving its fair share of lightning strikes, plagues, earthquakes and floods, the tower collapsed in 1902. News of the collapse spread throughout the world and finances came in to rebuild it just the way it was. Although slightly different – and much more stable – the building is strikingly remarkable to its ancestor and offers the same incredible panoramic view of the city. Open from 9 in the morning until 9 at night, San Marco's Campanile can be climbed for a modest €8 or $12. Groups of 20 or more are €4 a person. 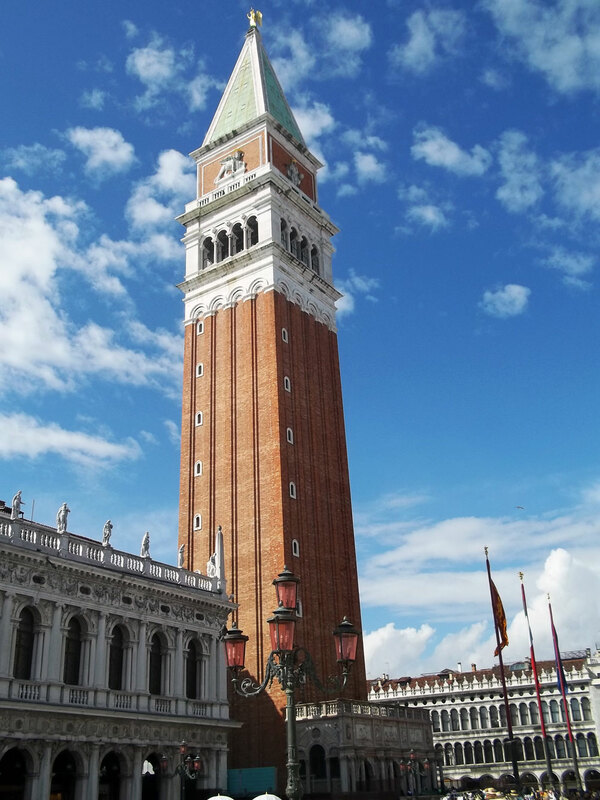 Fans of the "Assassin's Creed" series will recognize San Marco's Campanile as it's the tower the assassin, Ezio, climbed (although he scaled the walls, and you'll be using the stairs). Built combining the styles of Italy and the Byzantine Empire, this massive basilica wows tourists with its sheer size and gold plated decor long before they see the marble columns, stone archways and hand painted masterworks that canvas the ceilings. My time inside the basilica was limited, and with flash photography forbidden, I don't recall much of it other than being utterly floored. At the time, this was the oldest building I had ever been inside of, being just under a thousand years old. To me, anything older than 200 hundred years old is an antique, but this building was almost five times that in age! 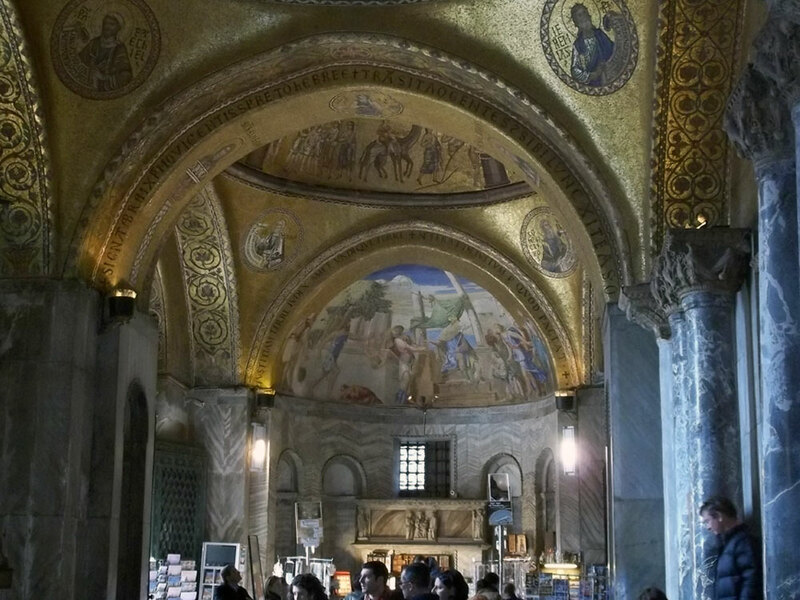 While structures like Florence's Dumo, Montreal's Notre Dame or the Vatican's St. Peter's Basilica are some of the most beautiful I have ever seen, the inside of San Marco's Basilica is the one that captured my heart and introduced me into a world that was before high school history textbooks, and I'm sure it will do the same for you. The origin of this bridge's name is controversial, but the current version rose to popularity during the 19th Century. The story is that the view from the bridge was the last Venetian convicts saw before being imprisoned, so they would sigh in grief knowing they would never again visit this beautiful city. This story sounds poetic, but history tells us this probably wasn't the case, as hardened criminals weren't imprisoned in Venice, and executions that had once occurred in Venice were long gone by the time the bridge was built. 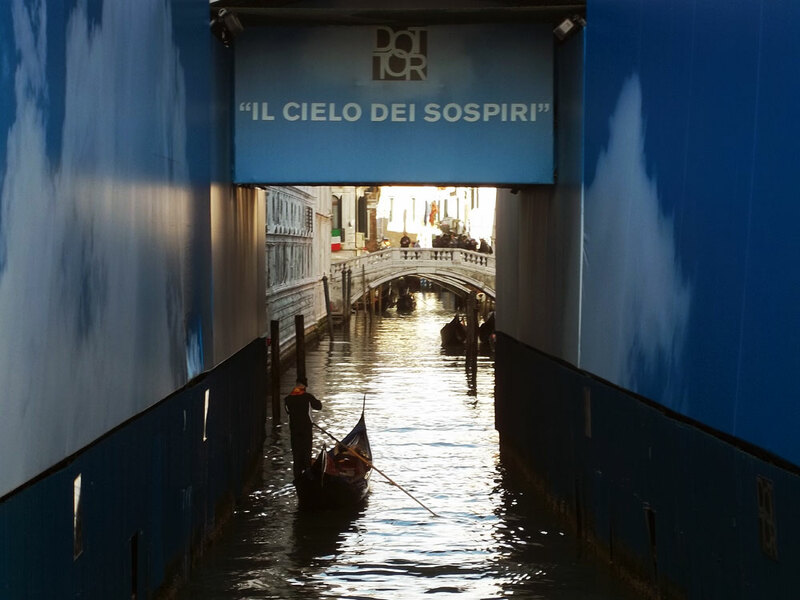 Another story is that lovers will be given eternal love if they kiss on a gondola during sunset while under the Bridge of Sighs as the bells of San Marco's Campanile toll. The truth of this folklore is probably as true as the story behind the bridge's name, but it's a good story to tell your love interest if you cross under the bridge and you hear the bells ring. One of the reasons Venice is so beautiful is because it's so disorienting. Just looking at a map will have tourists scratching their heads in confusion. Some bridges seem to appear out of nowhere, while others seem to go nowhere. Walking around the canals will lead you into circles, and trying to find your way someplace is about as easy as solving a rubric's cube blindfolded. But, that is the beauty of Venice. Venice makes you slow down and think about where you are, how you got there and where you are headed. It makes you ponder the purpose of life, the purpose of creation and why we are all here on this rock flying through space. It will make you ponder your very existence… that is, until you finally find that stupid street you were looking for and can get some strawberry flavored gelato! Yes! You're in the heart of Northern Italy, the land of pasta, wine and stereotypically late trains; relax a little! Italy is famous for its food so feel free to try some! Unlike in North American, the purpose of eating isn't to get full, but to actually enjoy the meal. Try the spaghetti, try the pici, try the vermicelli, try the lasagna, try the linguine, try the ravioli, try the stringozzi, try the farfalloni, try the fiori, try the rotelle, try the conchigliette... and when you're tired of pasta, have the antipasto (although that typically comes before the pasta... whatever...), and when you're tired of that, have some wine! Sometimes it's difficult to remember you aren't at home when you're traveling, so do your best to embrace the culture, try their food and enjoy your time in a different country. That's what traveling is all about; opening yourself up to the world around you and welcome it in, especially when it's bathed in alfredo sauce! It's been a long day. You've gone shopping, you've gone sightseeing, you went on a gondola, you hiked up a tower, you ate your weight in pasta and now you're relaxing, talking about the city you have fallen in love with. But as you chat about how beautiful this city is, the conversation slowly drifts towards another topic; that of Poveglia. Poveglia is an island off the coast of Venice that is forbidden by the Italian government for people to visit. Whispering over candlelight, with lights glistening in the canal and the quiet sloshing of the water below you, you begin swapping stories of Poveglia with whoever will hear. The island was used during the Black Death to abandon sick citizens, children included, so they could die alone and far from other people. The man who would lead these people across the water wore a bird's mask with a long, grotesque beak. He was the Plague Doctor, and his face would be illuminated by an orange lantern. This demonic face would be the last thing many people saw before they died of their horrible disease, but if they survived the night, they would see something even more grotesque: piles and piles of diseased, rotting corpses, a pile that within days they too would join. Once the Black Death vanished, Poveglia would become home to something even more horrendous: a mental asylum. Opening in 1922 and going until as late as 1968, the island would house thousands of mentally challenged, and often violent, patients. Rumours swirl that Poveglia was home to a doctor that found joy on performing crude lobotomies on his patients, often killing them. The stories say that the screams of the dead patients eventually drove the doctor insane and he threw himself from the hospital tower, killing himself and bringing peace to the souls of his victims. All cities in Europe are bathed in millenniums of history, lore and legend. Churches dot them, towers pronounce them and the people shape them. No city in Europe is the same, but many are similar. They are all historical locations, torn by war, rebuilt by peace and now coping with the modern world. The world is changing, and Europe is changing with it. The loss of culture and heritage is something that must happen for progress to occur, but, among the globalization and transformation of Europe, there's one place that is an escape from it all, and that place is Venice.